Sometimes you need a mixer; sometimes you need an IQ mixer. How do you know which one to buy? Before answering this question, I recommend reading the Mixer Basics Primer to get a good understanding of the fundamentals of mixers, the blog post ‘IQ, Image Reject, and Single Sideband-Mixers’ for and introduction to these mixers, and ‘How to think about IQ mixers’ if you want a deeper physical understanding of the mechanisms of IQ, image reject (IR), and single sideband (SSB) mixers. 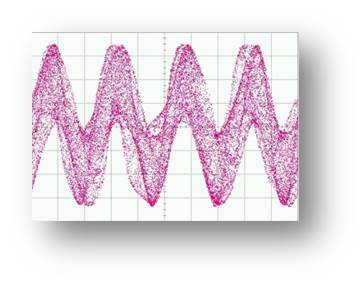 In this example, a signal is upconverted to an RF frequency, along with its identical but reversed image. The image and all other products are filtered out by a bandpass filter to comply with the system channel bandwidth requirements. 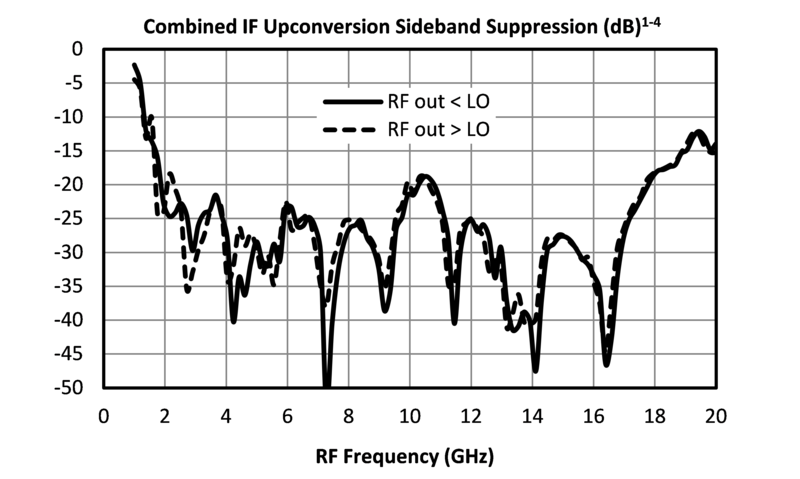 This single sideband is transmitted over some noisy transmission medium, then at the receiver a similar bandpass filter is used to eliminate noise and adjacent channel transmissions. The mixer then downconverts the RF signal to a lower IF, where it is demodulated. This is a great, time tested system, but it is not very flexible. The filters are generally large and most importantly not tunable. 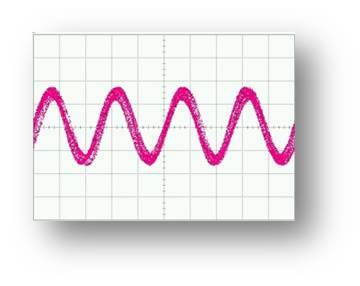 This means that the RF frequency cannot be changed from its fixed value. In this case the SSB mixer eliminates the image signal without the bandpass filter, and the IR mixer eliminates the signal in the image channel without a bandpass filter. Eliminating the filter means that the transceiver can be small and frequency agile. Without the bandpass filter the LO can be swept to any frequency that is in band for both mixers without penalty from nearby channels. Once again, the LO is tunable across the IQ mixers band without the need for a tunable filter. Consider each of these in turn, starting with limited rejection. IQ/IR/SSB mixers are based on vectorial cancellation, and as such are subject to the limits of phase and amplitude balance. In an IQ mixer the ‘sideband rejection’ refers to how well the I signal will be suppressed in the Q channel and vice versa. This is typically around 20-30 dB for very good broadband IQ mixers. It can be higher in lower frequency quadrature modulators used for communications, especially those with a fixed LO frequency. However, a radar system with a -60 dBc spurious spec will not be anywhere close with a broadband IQ mixer. This requires filtering. Arithmetically, the LO feedthrough and the 2IF x LO spur will always be closer in frequency to the upconverted signal than its opposite sideband, and these are only suppressed by the balance of the mixer cores inside the IQ mixer. They are not further suppressed by the IQ mixer structure. Typically a system is specified according to its maximum allowable spur level by the spur free dynamic range (SFDR). This is limited by either the LO feedthrough or the sideband suppression, so improving the sideband suppression better than the LO feedthrough is generally not worthwhile. All of the spurious suppressions in an IQ mixer are based on vectorial cancellation, which means that they are subject to the limits of this technique. It is difficult to maintain good amplitude and phase balance over broad bandwidths, temperature variation, and time. 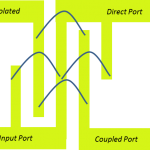 Since an IR/SSB mixer requires a quadrature hybrid on the IF ports, this means that it is limited to the bandwidth over which a quadrature shift can be accomplished with the data, which is typically limited to 2-3:1 bandwidths, and not at DC. These impairments can and are actively tuned out somewhat by using a digital to analog converter on the IF ports to create an SSB mixer or an analog to digital converter on the IF ports to create an IR mixer. This tuning is usually limited to around 10 dB of increased image suppression by the quantization noise of the converter. 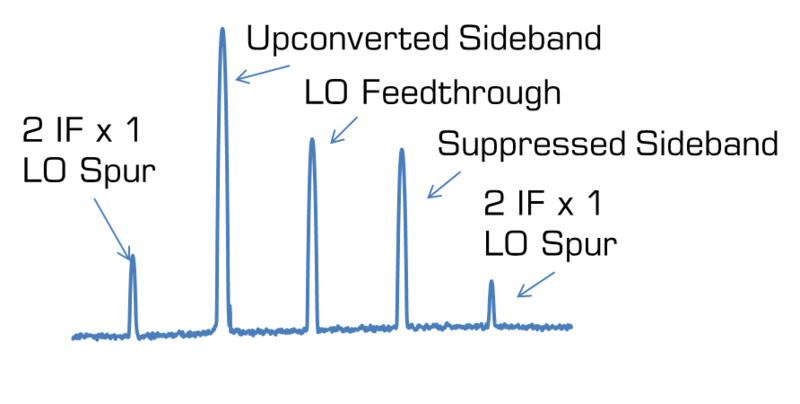 Modern RF ADCs and DACs typically have registers specifically for holding the correction coefficients for the amplitude and phase, and these can be programmed during a burn-in procedure. Let’s examine a simple application: shifting a fixed LO frequency by a small variable (or fixed) offset. Note that there is still residual noise from the image frequency, the LO feedthrough, and the spurious tones. The spurs can be reduced by lowering the input power, and the sideband suppression can be tuned by varying the IF phase if that is available. Ultimately, however, a noise free output cannot be achieved. This is deterministic, however, which means that someone out there has probably already found a way to program a DAC to eliminate the sideband with forward error correction. If you know of someone who has done this, let me know, I would be interested to see it. In the meantime, check out some of our super small, high balance, broadband, and world class sideband rejecting MLIQ mixers, and contact us if you have a new application that is not being served. We want order some I/Q Mixer . From our current offerings I would recommend the MLIQ-0218. In the next three months we expect to have a MMIC IQ mixer that covers 2-6 GHz that would be preferred, but this is not available right now.